THE owner of a popular Leith recording studio has launched a crowdfunding campaign to reopen his business which was forced to close last year. 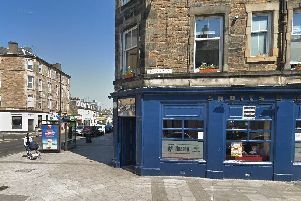 Leith Recording Studio was left homeless after Drum Property Group refused to renew the lease on its first floor studio at Stead’s Place on Leith Walk ahead of proposed demolition plans. Owner Alan Moffat, 43, was one of several small business owners who had to vacate the sandstone block which Drum intends to bulldoze and replace with a £50 million development, including student flats and a hotel. Despite the developer’s plans being rejected by councillors in January the firm has said it will not reopen the boarded-up units, leaving the likes of Alan no option but to find new premises elsewhere. “It’s been a really frustrating time,” he said. “Over the last two years we have been so proud to work with some really great local talent – from solo bagpipers to heavy metal bands. We had a successful business valued by the community. “We repeatedly asked if we could extend our lease on a month-to-month basis just to give us time to find new premises and raise funds to kit out a new studio but Drum flatly refused. It’s tragic to think that the room that we were trading from has lain empty for the last five months. What a terrible waste. Alan has now found a new home for Leith Recording Company at Anderson Place near the Biscuit Factory. He has plunged his £5,000 savings into rebuilding his studio but requires another £10,000 to reopen the business he has operated for five years. He has helped around 60 acts record their music before closing in October last year and wants to get back working with the “phenomenal” talent in the Capital as soon as possible. Alan admits to feeling “humbled” after more than £1,000 was raised in just a few days. The Glaswegian added: “I’m not used to asking for help, especially as this will be a commercial business that I’ll be running, but I’m asking for the people of Leith, Edinburgh and music lovers anywhere to help us get back on our feet and reopen this important community resource. Alan plans to have a permanent ‘Wall of Fame’ in the studio’s live room where every donor’s name will appear as a thank you for their support. “Anything that people can do to help would be very much appreciated,” he said.